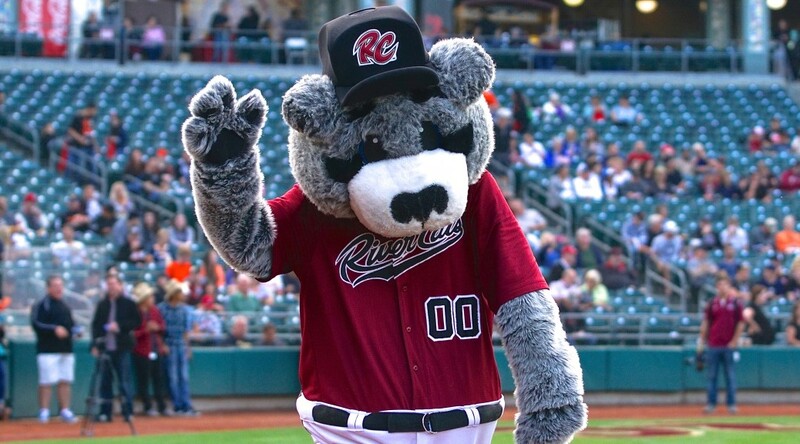 WEST SACRAMENTO, Calif. – The Sacramento River Cats closed out the 2015 season on Monday afternoon with what may have been their most all-around impressive win of the season, an overpowering 11-0 shutout against the Albuquerque Isotopes. The middle of the lineup brought the big bats to the park for the Labor Day matinee finale and Nik Turley went seven strong to cap the season with his seventh win of the season. Sacramento’s three-four-five hitters Kevin Frandsen, Jarrett Parker, and Mac Williamson combined to go 6-for-10 with three home runs, seven RBI, and five runs scored. Williamson had perhaps the biggest afternoon, slugging two of those home runs – a solo shot and a two-run blast – and driving in three. Jarrett Parker contributed the third homer, a three-run blast in the third inning. Overall, the River Cats offense tallied 13 hits and scored 11 runs. Seven of nine starters recorded at least one hit, while four of nine recorded multiple. Seven different River Cats scored in the blowout win. Turley looked superb on the mound in his last start of the year. The left-hander threw seven scoreless innings while giving up just two hits. He walked four and struck out eight. This is the third time the southpaw has struck out eight in a game, matching his season high. San Francisco Giants’ pitcher Matt Cain pitched two scoreless innings of relief for the River Cats Monday afternoon. Cain closed out the game, throwing 32 pitches (25 strikes) while giving up two hits and striking out two. He is expected to return to the Giants tomorrow. Sacramento closes out their inaugural season as the Triple-A affiliate of the San Francisco Giants with a record of 71-73. The season saw many historic feats, including the first cycle in team history by Adam Duvall on April 18, as well as the franchise-long winning streak of 13 games (8/9-8-22). The River Cats will begin the 2016 season in Salt Lake on April 7. 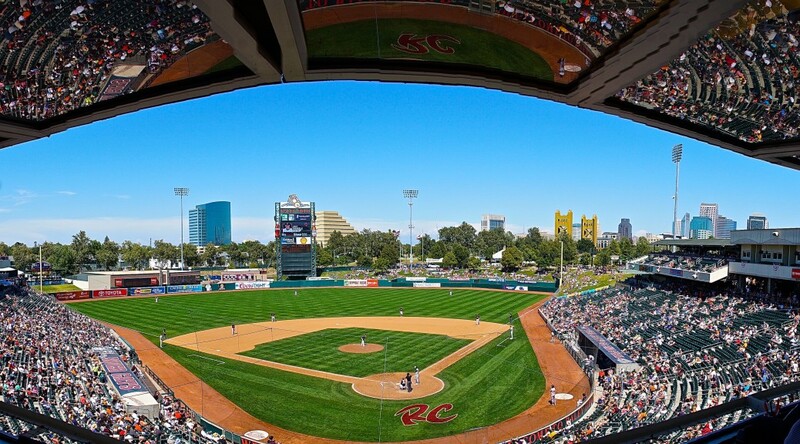 The home opener for the 2016 year will be on Friday, April 15, when Sacramento plays host to the Bees. 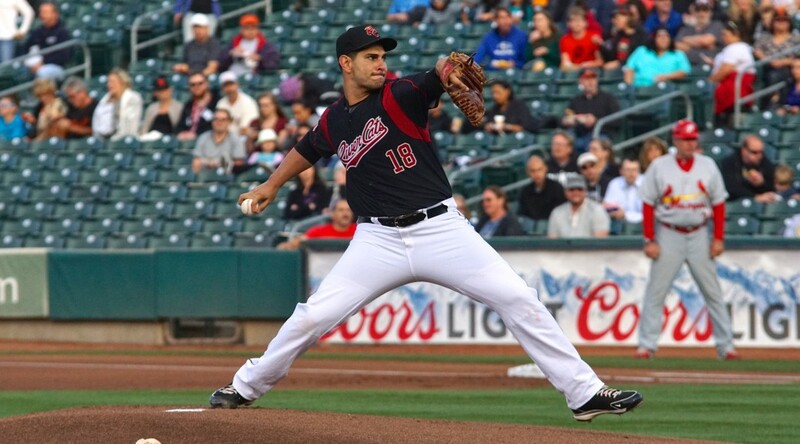 ALBUQUERQUE, N.M. – After an unexpected rain storm washed away last night’s game, the Sacramento River Cats and Isotopes took part in a doubleheader Monday. 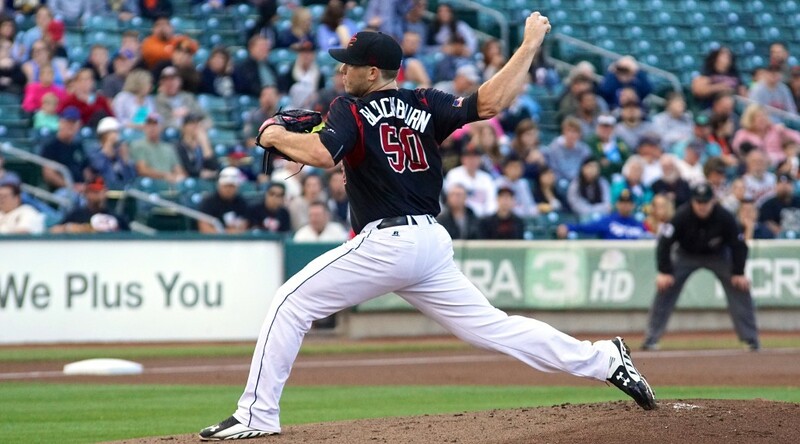 Thanks to phenomenal starts from both Ty Blach and Chris Stratton, as well as another big day by Adam Duvall, Sacramento crushed Albuquerque in both games of the doubleheader (10-0 and 10-1) and grabbed the series victory. Blach (9-8, 4.00) was masterful in the opening game. The left-hander went the distance, throwing a 7-inning shutout while allowing just 4 hits and no walks. Blach also got the job done offensively, going 2-for-4 at the plate with 2-RBIs. Every River Cat who played in game one recorded a hit, and all but three recorded multi-hit games. Overall, the River Cats scored 10 runs on 16 hits to provide more than enough offense for Blach. 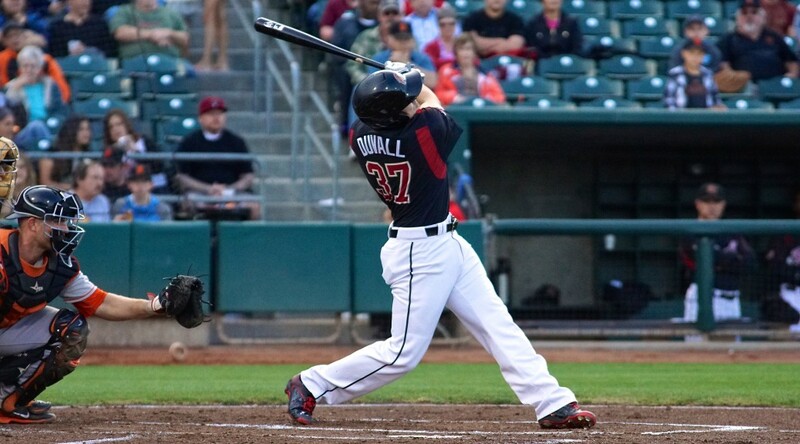 Sacramento’s offensive outburst was once again led by Duvall. He went 3-for-4 with a home run, double, and 4 RBIs in game one. Carlos Triunfel went 1-for-4 with a solo home run in the second inning. The first four spots in the order (Kelby Tomlinson, Ryan Lollis, Juan Perez, and Duvall) combined to go 9-for-15 in game one of the double-dip. Game two seemed to be a continuation of the first game, as Duvall launched a three-run home run in the very first inning. Overall, Duvall finished the doubleheader going 4-for-8 with 2 home runs, a double, and 7 RBIs. The River Cats would add two more in the second, and then put up 4 runs while sending 10 men to the plate in the fifth. Right-hander Chris Stratton (1-3, 3.02) finally earned his first Triple-A win in the final game Monday. The former first round pick went all 7 innings, allowing just 1 run on 3 hits, walking 2 and striking out 4. Like Blach, Stratton also helped himself from the plate, going 2-for-3 with 2 RBIs and a run scored. Monday was the second doubleheader the River Cats have had this season. Earlier in the month on July 7, Sacramento and Reno split a doubleheader at Aces Ballpark, which due to rain delays did not conclude until after one o’clock in the morning. The River Cats will now look forward to a four game series at Raley Field against the visiting Las Vegas 51s. Toeing the rubber in game one of that series will be the veteran right-hander Tommy Hanson (0-3, 6.41). Opposing him will the another veteran of the Major League level, righty Dillon Gee (4-1, 6.35). 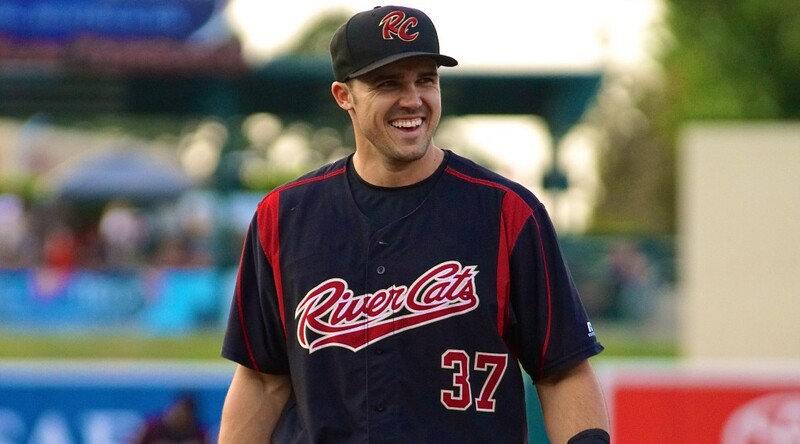 First pitch Tuesday is set for 7:05 p.m.
WEST SACRAMENTO, Calif. – What would have been an excellent backhanded play by Sacramento River Cats’ first baseman Adam Duvall turned instead into a contender for the play of the season for Sacramento. Duvall combined with second baseman Brandon Hicks and pitcher Brett Bochy to turn a sure base hit into what was likely the out of the year. Bochy entered the game in the top of the 8th, taking over for River Cats’ starter Tommy Hanson. On Bochy’s fifth pitch of the night, El Paso’s Alex Dickerson smashed a hard groundball to Duvall’s right. The first baseman moved quickly to his backhand, looking to snag a tricky hop, only to watch as the ball ricocheted off his glove and high into the air. The ball shot out into shallow right field where Hicks came sprinting across. The second baseman plucked the ball from the air and, on the run, spun and fired the ball toward first base. His throw was a bullet, but placed perfectly. Bochy, who started the whole thing with his pitch, had moved to cover first on contact. Seeing the ball careen off Duvall’s mitt, the right-hander started to slow, but resumed his sprint as Hicks moved on the ball. Bochy caught the throw in stride, hitting the bag just a split-second before Dickerson came down on the base. On the other side of the ball, third baseman Kevin Frandsen went 3-for-4 at the plate with a double, an RBI, and a run scored. 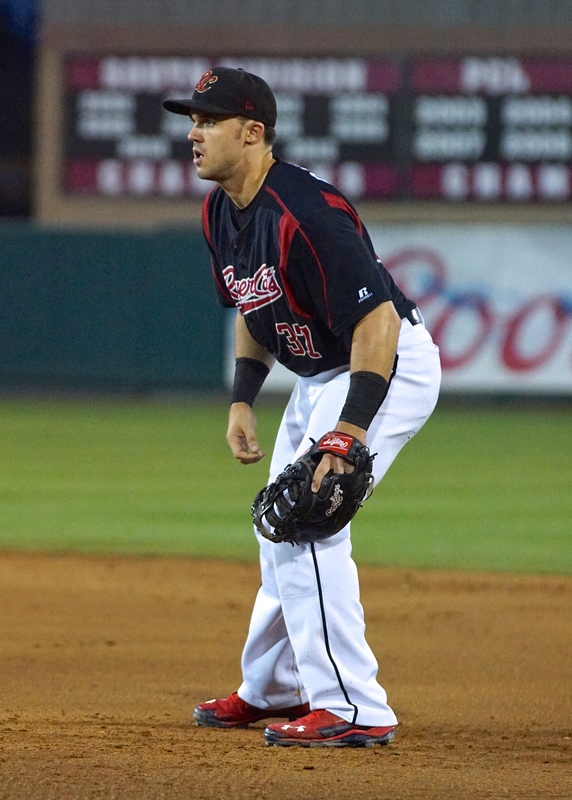 His three hits snapped a three-game skid, during which Frandsen had been hitless in 11 at bats. His seventh inning double just missed leaving the ballpark, hitting high off the wall in deep left-center. The hit scored Mac Williamson all the way from first and gave the River Cats their first run of the night. 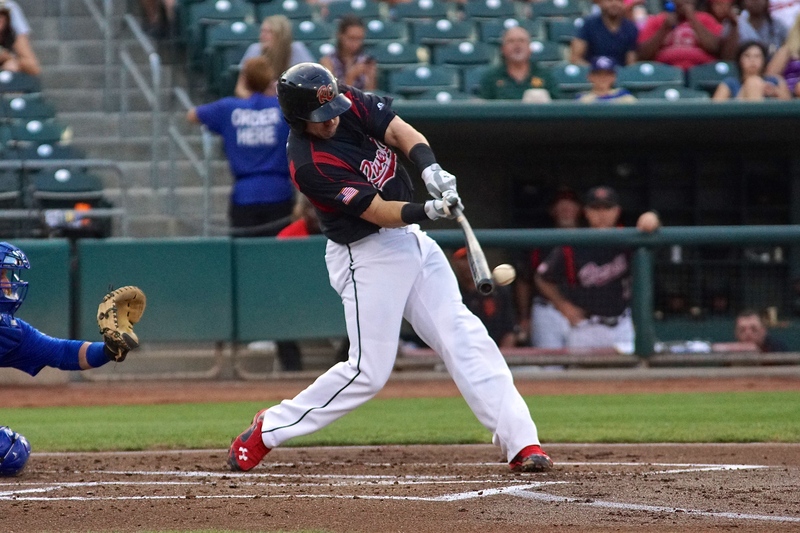 Sacramento scored again in the inning as Hicks singled Frandsen home. Hanson (0-3, 6.41) had his longest outing of the season, going 7 innings while taking his third loss with Sacramento. He gave up 5 runs (4 earned) on 7 hits and a walk while striking out 2. 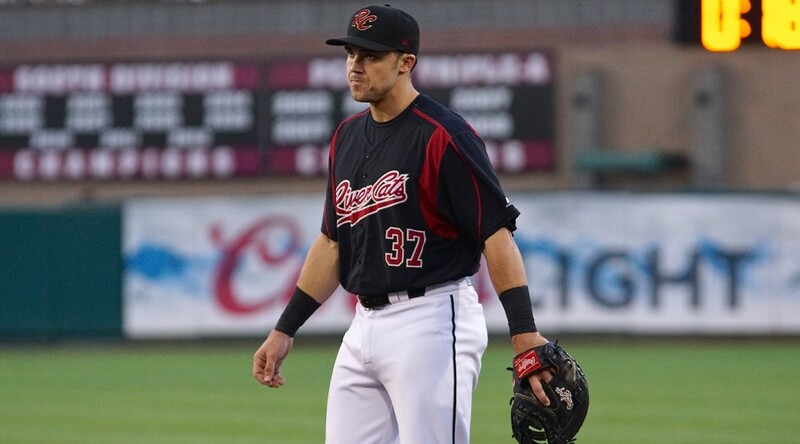 The one walk was a new best for Hanson since joining the River Cats. Bochy and Erik Cordier combined for two scoreless innings out of the bullpen. 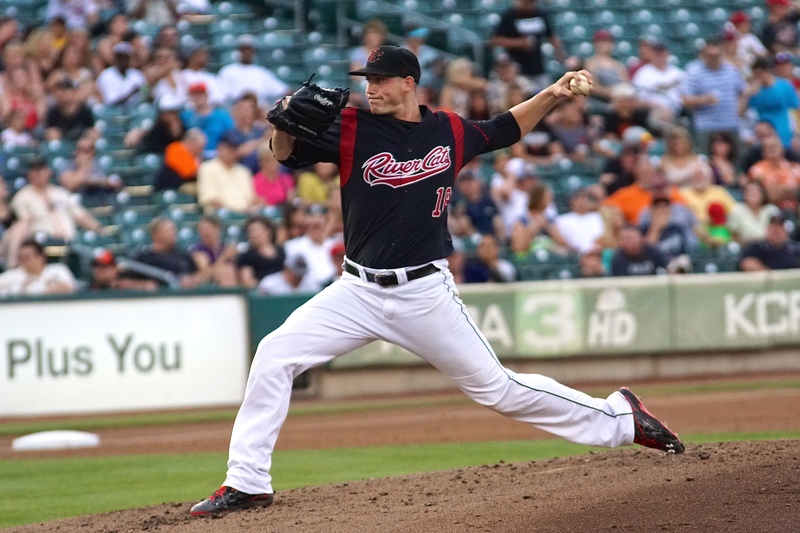 The River Cats head to Albuquerque next to take on the Pacific Southern’s Isotopes. The River Cats are 4-4 against the ‘Topes this season, splitting one series at home and one on the road. 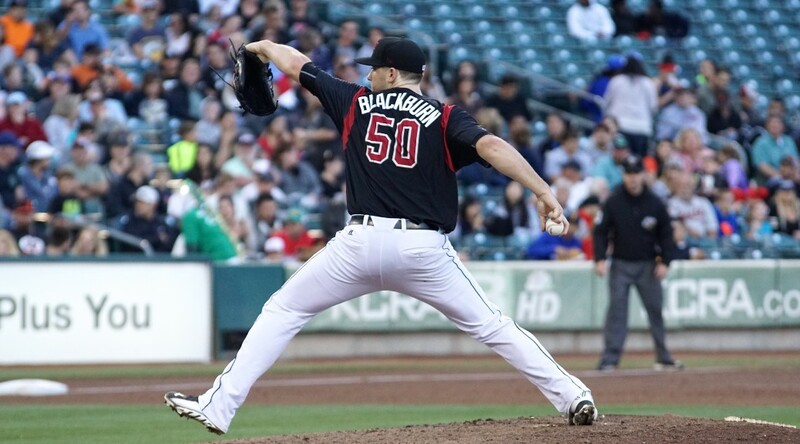 RHP Clayton Blackburn (4-3, 3.97) will kick off the four-game stint for Sacramento while Rockies prospect Jon Gray (5-56, 4.57) goes for Albuquerque. First pitch is set for 6:05 p.m. (PT). 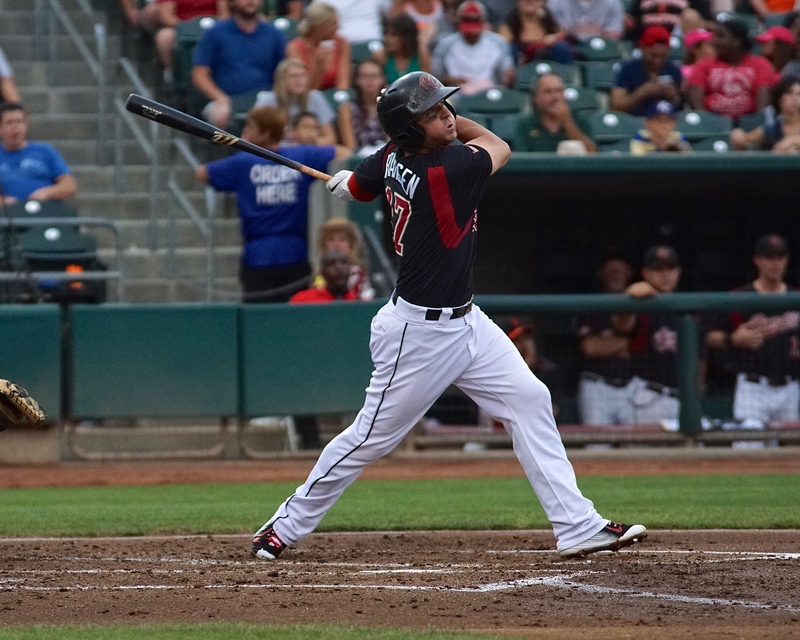 ALBUQUERQUE, N.M. – The Sacramento River Cats came out swinging in game two with the Albuquerque Isotopes Saturday night at Isotopes Park. Sacramento jumped ahead early, scoring five times in the first two innings, but couldn’t make the lead stick as Albuquerque took advantage of three River Cats’ errors to take the contest 9-6. Sacramento started the scoring right away, going up 1-0 in the top of the first. With Everth Cabrera on third, Adam Duvall drove a deep fly ball to center, bringing Cabrera home on the sacrifice. The RBI was Duvall’s 71st of the season and fourth of the series. With 71 RBIs, Duvall now moves into a tie for second most in the PCL. 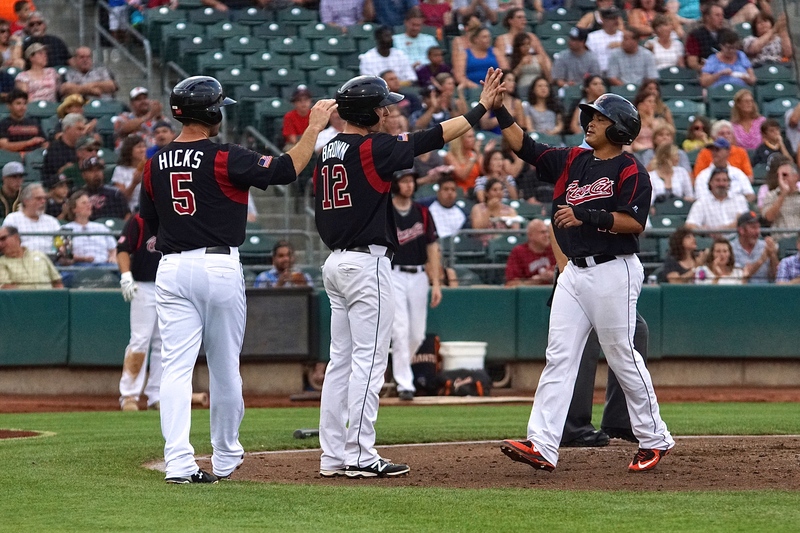 The River Cats continued to add to their early runs, scoring four times in the second. Two of the runs came on a mammoth home run to right field off the bat of Jarrett Parker. The homer was his 15th of the year and gives him 47 RBIs. Sacramento continued to pile on, adding two more runs when starting pitcher Nik Turley lined a single into right-center. The base hit brought home Kevin Frandsen and Brandon Hicks to put the River Cats up 4-3 after two. 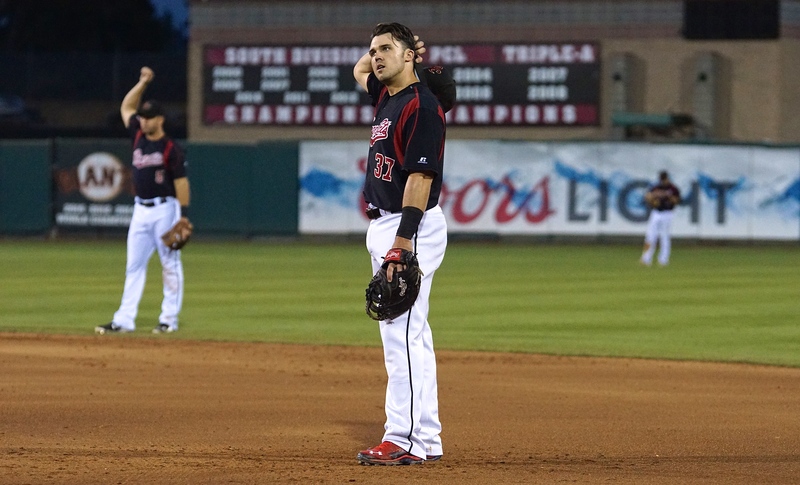 Turley couldn’t keep the Isotopes from mounting a comeback, though, as the left-hander surrendered nine runs (five earned) on 11 hits in just four innings of work. The 11 hits are the most the southpaw has allowed in a start this season, and the most since his first start when he allowed eight at home against the Las Vegas 51s. 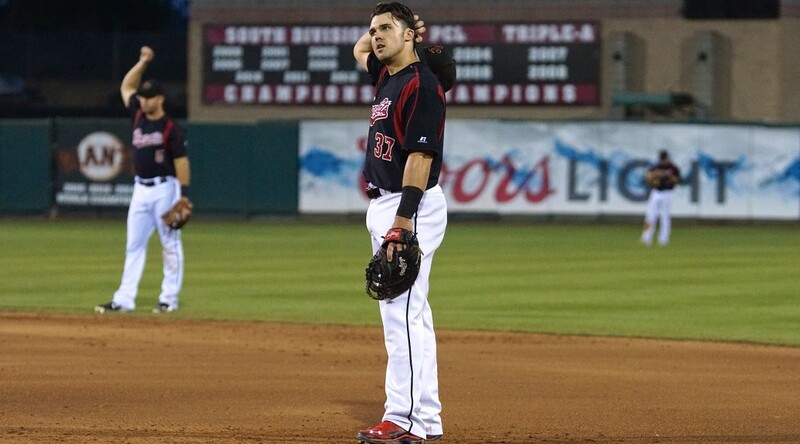 He didn’t get much support from his defense, as the River Cats committed three errors for the 12th time this season. Those three errors turned into four unearned runs for the Isotopes, who would eventually win the game by three. Albuquerque’s Tim Smalling was 2-for-4 for the Isotopes, with his fifth home run of the season. Of those five homers, three of them have come against Sacramento pitchers. San Francisco Giants outfielder Nori Aoki had the best game of his rehab assignment with Sacramento, going 2-for-3 at the plate with a walk and a run. One of his hits was a solid single to center field and the other was a slow roller to first that the speedy outfielder beat out for a base hit. 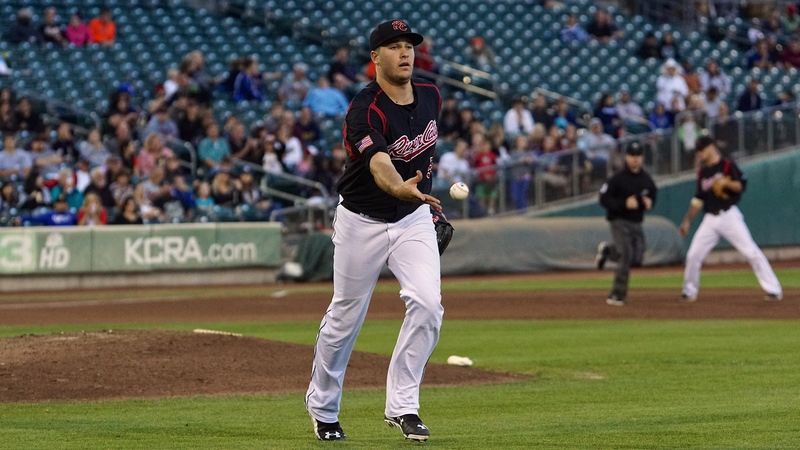 Sacramento will get at it again tomorrow night as they send left-hander Ty Blach (8-8, 4.17) to the bump. Blach’s eight wins are second most in the PCL and his 1.39 BB/IP ratio is the best in the PCL. Opposing him will be the veteran left-hander John Lannan (6-4, 4.70). First pitch is set for 5:05 p.m. (PT) and the game will air live online at rivercats.com and on air on ESPN 1320.